Daniel Frost is the definition of determination. Diagnosed with rare bone disease Multiple Hereditary Exostosis at just four, Daniel has endured the removal of more than 200 tumours, some cancerous, during his life. It has been a vicious cycle of operations, followed by months of physiotherapy and rehabilitation. Due to his medical condition, doctors predicted Daniel would be unlikely to have a career involving physical work. "It became my childhood dream to attend university. And when a career adviser told me I should aim to work in a fast food restaurant as 'kids from this school don't go to uni', I became even more determined." Missing most of his final year of high school due to hospital time to undergo painful medical procedures, Daniel pursued his dream to enter university through the University's enabling program Open Foundation. His hard-working attitude and determination rewarded him with an ATAR of 90.00 and entry into a Bachelor of Business. 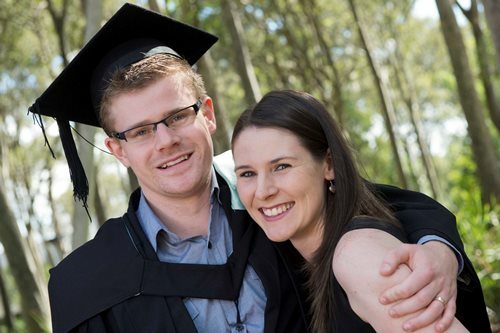 "I'm proud to say that I'm now an alumnus of the University of Newcastle. I wasn't always sure I would reach this milestone – there were many times when graduating seemed out of reach for me, impossible to achieve." Daniel's commitment to his studies and his eternally positive outlook saw him awarded one of the inaugural Shaping Futures Scholarships in 2011, the first year of his degree. The scholarship allowed him to purchase a computer, making his studies easier and reinforcing his determination to succeed. "As part of my condition I have a permanently dislocated wrist and elbow. Writing out my assignments and lecture notes was extremely painful and difficult for me – but having a laptop made all the difference. I even used it to keep up with my study in hospital when I missed much of semester 1 in 2012, due to a staph infection I acquired after an operation. "Being supported through the kindness of strangers is awe-inspiring and one day I too hope to be able to help students who are facing hardship." The Shaping Futures Scholarships are funded entirely through donations from alumni, staff, donors, community members and businesses. "For me, a extra financial support was what I needed to provide me with the encouragement and the financial means to complete my degree, and reach my full potential. I can't thank the people who donated to this scholarship enough - you have helped me realise my dream," said Daniel. Daniel has completed Honours and has been selected to join the Australian Government's Treasury department as a Corporate Analyst as part of its graduate program, which he started in February.